This is a small game made for the MAGS competition in December, starring Murray (from Monkey Island 3), the demonic talking skull, as the main character. The game lands him (literally) on a planet inhabited by koalas and badgers, aswell as many other creatures, probably, who, not surprisingly, also possess the gift of speech. Will Murray succeed in his quest to return home to earth, and will he be able to save the earth (well, the planet) on his way? 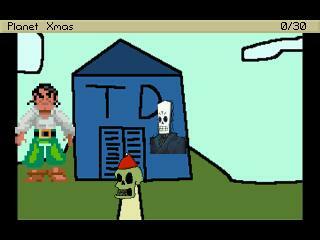 Guest stars: Manny Calavera (from Grim Fandango) and Largo LeGrande (from Monkey Island 2). Terrible. I brute forced the puzzle because I couldn't understand it. Hotspots were still named Hotspot. Not many interactions. Cameos from famous characters for no reason.